As a Toronto wedding photographer, I photograph various types of couples. Some couples are outgoing, making my job easy, while others are more introverted so I need to give them more direction to create beautiful wedding photos. I love it when brides open up and allow me to photograph them the way they are in real life and not just pose for the camera. This bride whose wedding I shot at Atlantis Toronto, is a close friend of mine, so she was comfortable in front of my lens. to capture the best reactions and help my couples relax, a strategy that works for me is to give the subjects something to do with their hands. That keeps the subjects distracted and elicits genuine reactions resulting in the gorgeous semi-candid shots. During bride's preparation for her wedding at Atlantis Toronto, the bride and one of the bridesmaids decided to have a bit of fun. As such, they picked their lipsticks and pretended to use them like cigars. 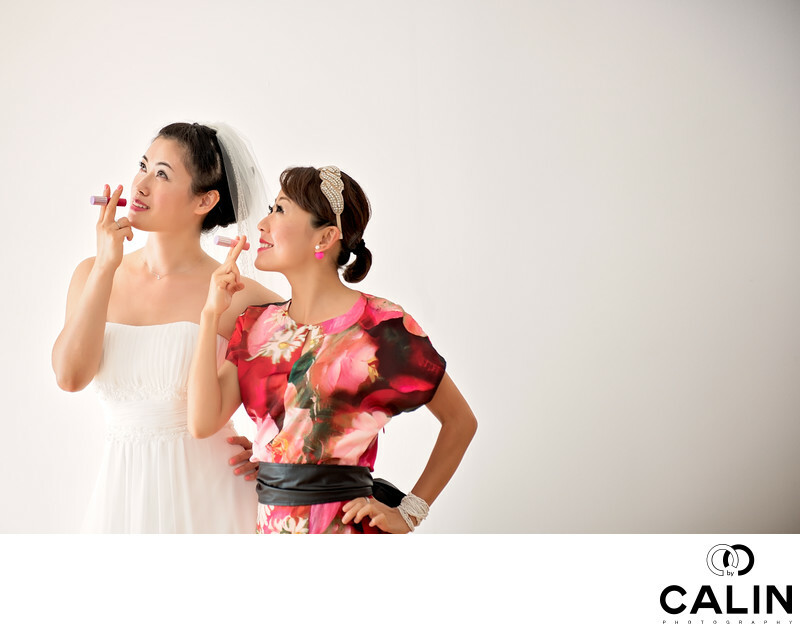 The bride is on the left wearing a white gown while the bridesmaid is wearing a traditional Chinese dress. Both of them are trying to keep a straight face. From a posing perspective, I directed the girls to put one hand on the hip and to look up words at the same spot. For the wedding, the couple rented a house which fortunately was unfurnished which created a perfect backdrop for my wedding pictures. These images look like they were created in a high-end studio. That reiterates the fact that in creating a powerful image, the knowledge of light and experience are more important than fancy equipment. One of the challenges I had one photographing this image was to set the right exposure. I shoot about 90% of my wedding pictures in manual mode for a consistent exposure. However, as every good Toronto wedding photographer knows, a camera adjusts exposure for mid-grey or 18% grey. As such, I had to overexpose by about two stops so I can obtain a proper exposure. When the clouds covered the sun I had to pay attention to the meter and adjust accordingly. Besides the fun pose and the girls'' expression, what makes this picture is the bridesmaid's colourful dress. That makes this image vibrant and also draws attention to the bride. Without the bridesmaid, the white wedding gown would be lost in that white background. The image is a metaphor for the fact that girls are hooked on their lipsticks which, in this image become a catalyst of fun. Interestingly enough, after I capture this image I saw the same concept used in a Vogue lipstick advertisement.